Ronkonkoma, New York – When Sachem school district Superintendent James Nolan realized the Sachem Marching band needed financial support to survive he did what any good educator would do, he looked through his Rolodex to find some alumni that could help. He got all the way to the end of his list and found local radio super jocks Vic ‘Latino’ Canales and Matt Goldapper, the dynamic duo of top Long Island station Party 105 were not only graduates of the district, but they are also local radio legends! The Sachem school district went through a very difficult budget process and as with most districts on Long Island, they began scrambling to raise funds for their programs, organizations and teams. Their marching band, a staple for years, was caught up in this crunch and found out that they needed to raise between $45,000 and $50,000 just to keep the program in place. Many parents, teachers and friends thought this was a daunting, impossible task. That’s when Mr. Nolan stepped in and offered the idea of a band night, but how to pack the house and raise a lot of money, that’s when local radio stepped up to the plate. Vic ‘Latino’ Canales put his Twitter account into full send mode and called a few of his contacts, but who was in the Party 105 studio that day recording an interview- Superstar Shaggy! Within seconds the event was born. 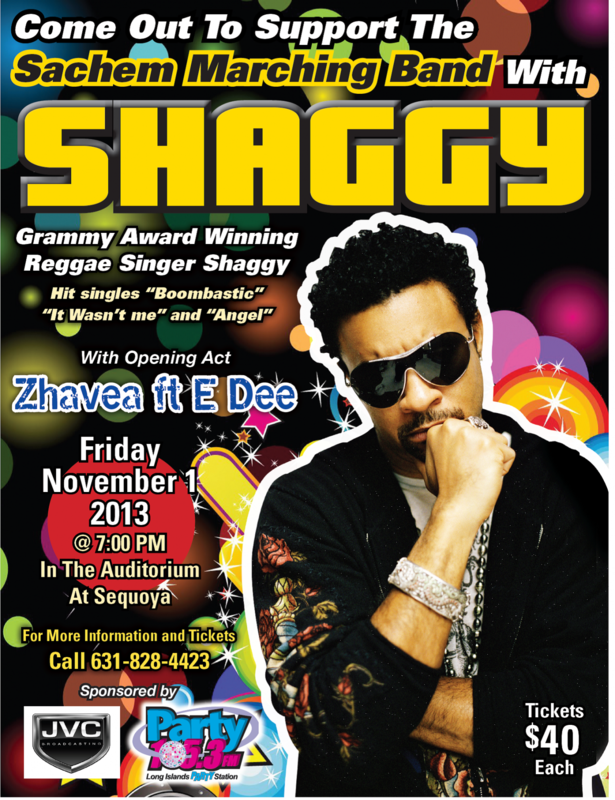 Grammy Award winning music sensation Shaggy is headlining the Save the Music Concert on Friday November 1st. Live from the Auditorium at Sequoya Middle School in Holtsville Shaggy will rock the house with all of his hits including “Boombastic”, “It Wasn’t me” and “Angel”. This is a first for the district a first for radio station Party 105 and even a first for Shaggy who never played a middle school auditorium! The radio station is a local favorite with students at Sachem, the largest school district on Long Island, but having a Party 105 Mega Jam concert in their middle school auditorium was unimaginable. “ I can’t thank the station enough”, said Guy Dellecave, Vice President of the Sachem Marching Band Parents Alliance, “ radio stations just don’t do this kind of stuff, but Party 105 and JVC Broadcasting are a local Long Island company and they are constantly doing things for the community, it is just great to have them in our backyard”, he added. “This event was a no-brainer for us’, said Vic ‘Latino’ Canales, COO of JVC Broadcasting, “Our company was built on the ideology that radio is live, local and all about the community, this is what we do, we bring live, local radio back to the community and we have fun doing it”. Ronkonkoma, New York – For the first time in the history of Long Island MacArthur Airport, radio station My Country 96.1, and Pen Air have teamed up to bring country music superstar Rodney Atkins to the atrium at the airport for a free lunch time concert at 12 on October 22nd. The live event is open to the public and will be the first of many live music events to highlight the new energy and promote the new business at Long Island’s MacArthur Airport. My Country 96.1 approached the airport management after learning that Atkins wanted to do a free show for the listeners of the radio station. Rodney Atkins, an East Tennessee native, is ready to rock the airport! He has an impressive track record with hitting on sentiments that strike a chord with the country listener. He has had six number one hits from his first three albums, and his most recent smash hits “Take a Back Road”, and “Farmers Daughter” have skyrocketed to platinum hits. He has sold over four million singles in the past five years. “This is only the beginning of our Airport Atrium lineup,” says Phathead, Director of Programming for My Country 96.1. “More great shows will be announced shortly---My Country 96.1 is committed to bring major national country music talent to Long Island because Long Island loves its country,” John Caracciolo, President of JVC Broadcasting said. “Thanks to our partners like The Town of Islip, Nardy Honda, Pen Air and Long Island MacArthur Airport we can start the tradition of superstar talent right in our own back yard, and for free too!